Possibly one of the most spectacular and amazing places in all of Italy is the medieval pile of stones that is the Sacra of San Michele monastery. Crowning the Mount Pirchiriano in Northern Italy, the Sacra di San Michele seemingly floats in the clouds, fanned by the incredible landscapes of the Val di Susa. Officially named as the Symbolic monument of the Piedmont region, this jaw-dropping abbey was probably consecrated in 966, but little is known about the early years of this amazing building. Tradition says that the Sacra di San Michele was erected by a pious hermit known as St Giovanni Vincenzo on the orders of archangel Michael – supposedly the angel then miraculously transported all of the stones and other materials to the summit of Mt Pirchiriano (though the miracles stopped there – St Giovanni still had to build the abbey!) Apparently the site was chosen for its isolation and difficulty to reach as this was typical of the Cult of St Michael (think France’s Mont Saint Michel!). The Sacra, part of the Benedictine Order, became part of the famous Via Francigena, an ancient pilgrimage route from France to Rome, even extending beyond to Canterbury. In fact, the route is still in use today, and has seen a recent revival and resurgence of pilgrims (though today’s pilgrims are more interested in the history and culture and food found on the trail, and less in the religious aspect of it). The Sacra di San Michele is also famous for inspiring the abbey at the central of Italian novel, The Name of the Rose by Umberto Eco. Pro tip: Instead of driving, start your adventure at the village of Sant’Ambrogio di Torino, where you can follow an ancient mule track up the mountain. Following the Signs of the Cross, the trail winds around the mountain, in and out of the forest, past tiny hamlets and ancient sites before arriving at the mountain’s summit. The path, about 3.5 km each way, starts behind the old church and continues upwards from there. 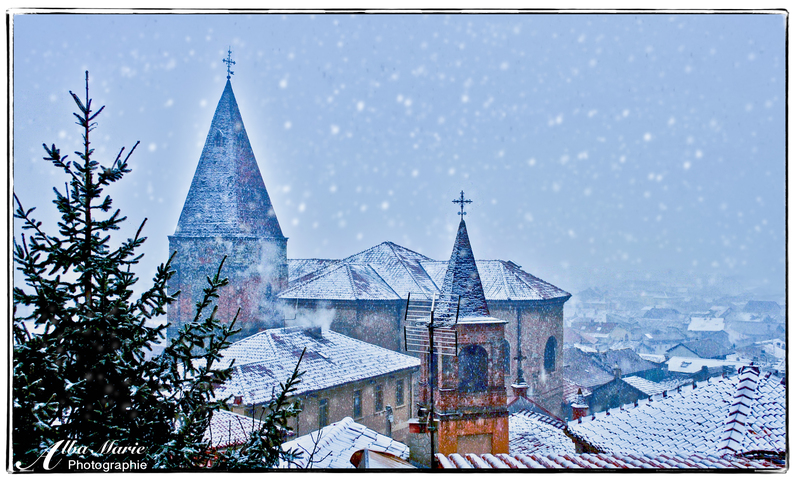 Soft, white snow slowly falls on the red clay rooftops of the sleepy village of Sant’Ambogio di Torino. This simple but picturesque village is snuggled soundly at the foot of Mount Pirchiriano. Crowned with the stone ruins of the legendary Sacra di San Michele monastery, Mt Pirchiriano and its monastery have been made famous by inspiring Umberto Eco’s classic novel, The Name of the Rose. Below the mountain, Sant’Ambrogio di Torino contains its own history and beauty: medieval wonders such as Middle Ages towers, fortified walls, a ruined abbey, a 12th century Romanesque-style bell tower (the tower in the above photo, now integrated to the current church), and the remains of an 11th century church, located above the town in the tiny commune of San Pietro. 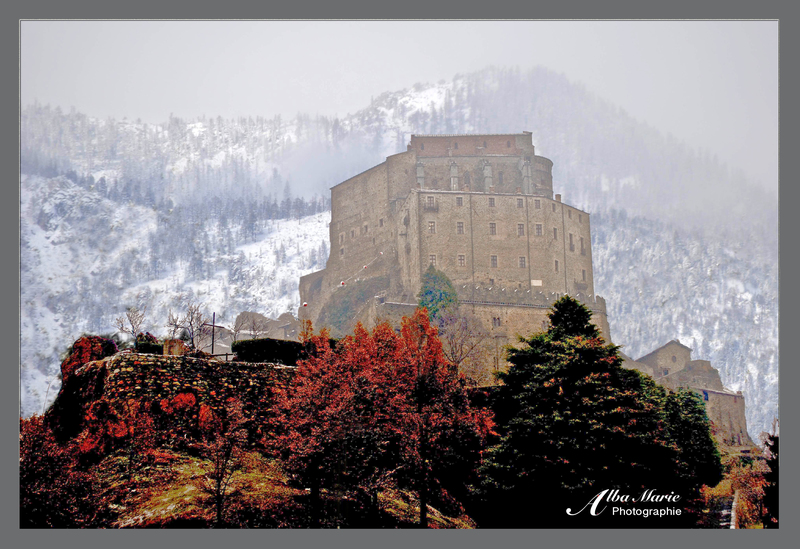 Sant’Ambrogio di Torino still plays the role it has for centuries: the starting place for the ancient pilgrimage path leading to the mountaintop Sacra di San Michele, as well as housing the relics of St John Vincent, the monastery’s founder. To mark the beginning of the pilgrim’s path weaving through the mystical Val de Susa, is the lovely 18th-century Chiesa Parrocchiale di San Giovanni Vincenzo – today covered in a powdery blanket of snow. Though it may be faster to drive directly from Torino to the top of the mountain – bypassing Sant’Ambrogio village, the Pilgrim’s Path, and the Val de Susa altogether – the effect will be far less impressive or special; you will miss out on a homage to quiet village life, beautiful architecture, ancient tradition and stunning landscapes. Instead, take the train to Sant’Ambrogio from Torino central station, walk the quiet streets to the Chiesa di San Giovanni, and then follow the narrow cobblestone path to the sacred monastery above (roughly 2 hours hike). Exploring the region in the snow provides an added layer of beauty! Hidden among the curves of this ancient mule path (antica mulattiera) that carves its way up the mountain carrying pilgrims to the Sacra di San Michele as it has done for at least a thousand years, one will find 15 “stations of the cross,” a reminder to the route’s many pilgrims of why they are here. Cobblestones smoothed by millions of pilgrim’s boots line the rugged path that hugs the mountainside. 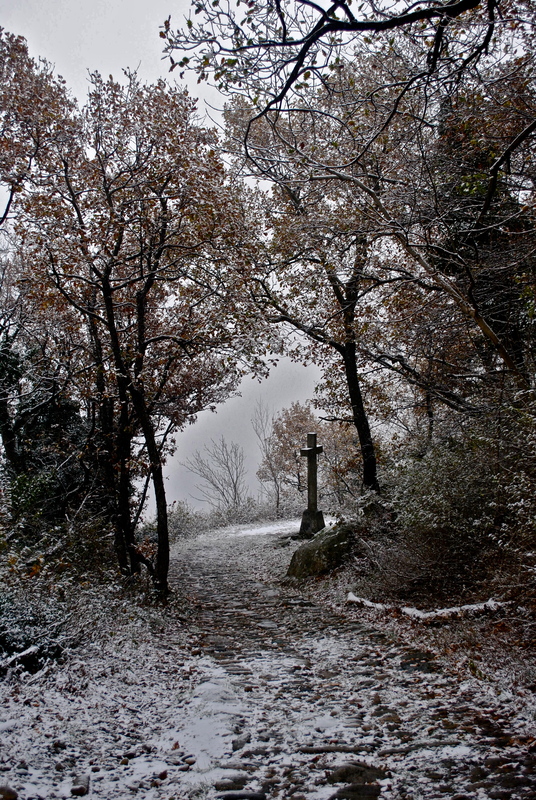 For those who want to leave behind the 21st century–travelling back in time to the middle ages when pilgrimages were a normal part of life for every believer, take this quiet forest path and enter into nature as you make your own pilgrimage to the monastery at the top. Not only will you be able to approach the monastery in the traditional way and understand what life would have been like for a medieval pilgrim, but along the way you’ll be privy to amazing views and hillside villages. As you make your soul-searching pilgrimage, you’ll have time to reflect on life and destiny. By the time you reach the top, you may very well be a changed person.